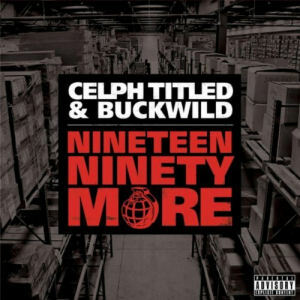 RapReviews.com Feature for December 6, 2011 - Celph Titled & Buckwild's "Nineteen Ninety More"
With the 2010 release of "Nineteen Ninety Now", underground favourite Celph Titled and legendary beatmaker Buckwild teamed up to drop an album that had many hip-hop heads reminiscing on the mid-nineties 'golden era' of rap. Buckwild gave Celph license to root through his unreleased instrumentals and handpick those he wanted for his first true LP. Every kick, snare and sleigh bell that you heard had been put together over fifteen years ago when Buck was laying down now-famous beats for some of hip-hop's most revered names such as Organized Konfusion, R.A the Rugged Man, O.C., Big L and Tha Alkaholiks . It proved to be a pretty smart move as Buckwild's instrumentals suited Celph Titled's aggressive yet humorous tone down to the ground and the album was met with universal acclaim. Little over a year later and the duo have decided to unveil a few more cuts from these recording sessions as well as a bucketful of bonus beats and package it as "Nineteen Ninety More". This is a double disc set comprising four previously unreleased tracks, three that were only available on vinyl and a remix as well as these instrumentals on disc one and all of the instrumentals from "Nineteen Ninety Now" on disc two. The artists featured on the original album helped add to the overall feeling of nostalgia and there is more of the same here as nineties survivors Lord Digga, Kwest and the Cella Dwellas all come through to join Laws, Outerspace and Rise to add to the old meets new ethos. Will Celph Titled sell out any show? Will Lil' Wayne look like Whoopie Goldberg when he's old? But when you come through you speed through like Mario Kart"
All of the guests deliver solid verses here to ensure that the level of quality doesn't drop and although there are only eight vocal tracks, not one of them will have you reaching for the fast-forward button on your Walkman. Access to this many Buckwild instrumentals is another good reason for owning this release. Without an MC over the top you can pick up on all of the little nuances in each track, from the spacey "Eraserheads" to the sombre "Time Travels On", and this makes for a unique listening experience in its own right. Although I would have liked to have seen a few more vocal tracks, "Nineteen Ninety More" serves as a nice accompaniment to the original album which I would recommend picking up first if you haven't already.